The rally that powered stocks to record gains in January went flat last week, but for a bullish reason: sustainability. 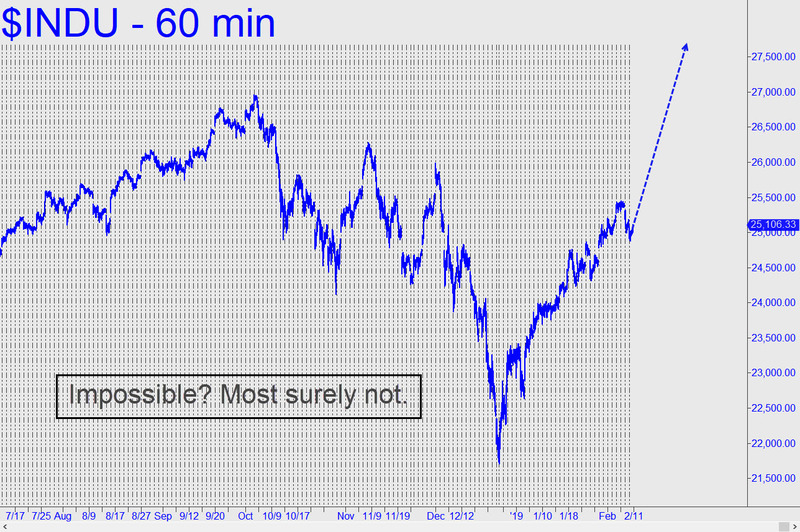 DaBoyz are in no great hurry to pretty up the illusion that new all-time highs are possible. With no time constraints, they’ve adopted a go-slow approach that investors and pundits can buy into. Keep in mind that if the Masters of the Universe are very successful at keeping this deception alive — by no means a given at the moment — a stock market with plenty of good reasons to fall could instead keep climbing. This will always be possible, since it is not the health of the economy that drives the markets, but the other way around. Purely cyclical forces cause stocks to rise and fall, often mysteriously. When shares are rising — manifestly for no good reason — this energizes and lubricates the gears that make the economy hum. The effect is mainly psychological: a change in attitude and perceptions caused by rising stocks that eventually brings a moribund economy back to life. It’s not even about getting to new highs yet although that’s a sure thing eventually. For now, all the bulls have to do is exceed the Dec 3 high by a penny on most charts and it’s a bullish cup formation. Should be like cake with the breadth numbers we’re seeing.